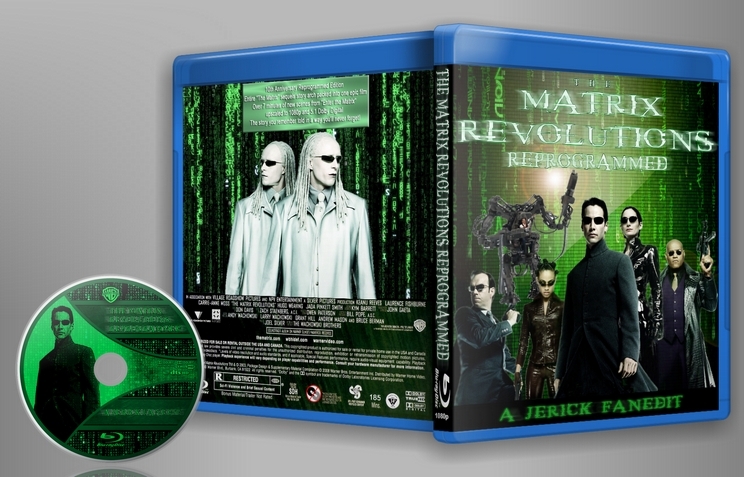 A 10th anniversary tribute to the original Matrix sequels, "The Matrix Revolutions: Reprogrammed" combines the two sequel films together with additional scenes from the "Enter the Matrix" to make a single epic action powerhouse. This edit maintains the core story of the original source while improving character motivations and stripping away many unnecessary and extraneous sub plots. In this version, Neo has no powers over machines in the real world, the Oracle's change in appearance is explained, the train station and club hell are removed, the battle for Zion is vastly improved, and much much more. This edit has now been replaced with 2014's 'The Matrix Revolutions Decoded'. 5 minutes of scenes from the "Enter the Matrix" video game have been seemlessly integrated into the film, upconverted to 1080p, and 5.1 Dolby Digital. Opening of the movie following title sequence picks up immediately after "The Animatrix: The Last Transmission of the Osiris" ends using scenes from the "Enter the Matrix" video game. All added scene from "Enter the Matrix" have been upconverted to 1080p, color corrected, sharpened, and had a custom 5.1 surround sound mix added. Several cuts made to the sequences leading up to Neo getting to the door to the source, Neo doesn't ask Trinity to stay out of the Matrix, the pacing has been quickened, etc. Cut several scenes building up hopelessness for the finale to help with pacing, believe me things are already plenty desperate enough! The new Oracle is now seen for the first time, she explains what happened to her original shell in a special easter egg on the bluray! I loved the first Matrix and like most of society, have less than an appreciation for the disappointing sequels. This fanedit is good from a technical standpoint but the overall narrative hasn't changed that much from the original films as mentioned by previous reviewers. There is a significant amount that has been cut in this fanedit but I can't help but feel that even more could have been cut. For example, I have never been fond of the Zion rave scene and was perplexed as to why the editor decided to keep it in. On the other hand, there are many smart edits in this version. I found the battle of the Zion dock was perfectly edited and is perhaps my favorite part of the edit. I also really enjoyed how the movie opened with scenes from Enter the Matrix, which I also think were masterfully used. This fanedit is leagues better than the original sequel movies and is worthy of a viewing. The best tribute to the sequels in their original form you can imagine. Stupendously good audio quality, video quality and incredibly professional editing come together to turn the original sequels into a single, continuous story, and it simply works. Toning down Neo's superpowers so he can't affect Sentinals, doesn't see Trinity's death and doesn't have to remove the bullet from her (since she is never shot in this edit) has remarkably little impact on the overall proceedings in a good way. The re-edited lead up to Neo finding the door for the source works considerably better than it did in the theatrical cut and reinforces the fact three teams are working together much more. The annoying sub-plot of Neo stuck in Matrix limbo is cut entirely with no major plot holes. There's still plenty of great action sequences - the shortened highway chase has ingeniously chosen cuts but is still highly enjoyable, as is the trimmed battle for Zion, although I don't entirely see the point of removing Kid's involvement other than for the sake of shortening the entire battle - and drama with minorly improved stakes thanks to the seamlessly added scenes from 'Enter The Matrix' that give more depth to Locke and Niobe, and even sometimes improving the already brilliant pacing. Faultless work from Jerick in the execution department, so well done there! However, the problem I have with this edit is hardly in the perfect execution of it's ideas, but rather the ideas themselves, it's purist nature. It strays very closely to the original narrative, and the problem with the original storyline IMO isn't it's focus on the fate of Zion so much as it's occasional ramblings into indulgent philosophy, and the fact that Zion's population mostly consists of secondary characters you never grow to truly care about. None of the new secondary characters ever develop beyond their initial traits (Niobe is always the strong-headed woman, Locke is always the stubborn commander, Link is always the likable family man etc), and any scenes that try to develop their personalities seem pointless because they only ever display their traits again rather than add real, unique development. The same can be said of the numerous moments of hollow-ringing philosophy since most of the time they involve secondary characters you don't care about, with limited direct impact on the story proceedings, and therefore they feel like unnecessary distractions from the action sequences, the core elements of the Matrix universe's mythology and the actual fate of Zion. It's simply boring storytelling. This edit includes *plenty* of these indulgent philosophy and redundant, repetitive secondary character development scenes, albeit brief ones, including the infamous Architect scene that is left mostly untouched and several scenes highlighting how the sequels love to constantly return to Morpheus' obsession with his mental book "THE PROPHECY: HOW NEO WILL SAVE US ALL". It's just paced extremely well with the worst fat from Revolutions trimmed. I also thought the change that tries to make it seem as if the Oracle's appearance remains the same was unnecessary, since it's already explained in the movie albeit poorly and would only add a few minutes to the running time if you left it as is. The issue is made even worse by your decision to leave the ending as is, making the change in The Oracle's appearance confusing as hell unless you're already familiar with the film, and IMO all fanedits should be created with the assumption that you are showing it to someone who has never seen the film before to avoid this. I understand there's a post-credits scene explaining the change, but that doesn't make it seem any less unnecessary or confusing since the story is technically over by that point anyway. Some poor acknowledgement within the film itself is much better than some good acknowledgement once the story is over. So for those reasons, this edit isn't for me. Geminigod's Epic Edition remains my go-to version of the sequels for shifting the overall focus, toning down the philosophy and secondary character development to fairer levels, despite some rougher editing. But I applaud Jerick for doing such a quality job with Reprogrammed, even more so since it's his first release. Recommended for Matrix fans. I liked it. You really tightened it up from what I remember of the theatrical versions. It actually made sense to me as well! I agree with most of the points of the other reviews, it's a step up. Tied to that is Neo's real world power. You scaled it back to just sight, and it worked really well. Now for the audio/video quality, it was great. I watched it on Vimeo, so loading hiccups aside, it looked great. Visual editing was mostly great. A few scenes I remember noticing editing: When Neo saves Trinity as the building falls. This is not just because it was a memorable scene in theatres, but when they land on the roof, the cuts are really quick and hard. Tough to get around that I know, but it was noticeable. Another spot was when Smith copies himself into the oracle. This scene is very clearly edited, with most of the oracle's lines omitted. Another spot was when Mifune is opening the gate. It seemed like he didn't really have an intention to open it and it seemed like there was some editing there to make it fit, it just didn't work for me. Finally, when Neo and Trinity are going to the machine city there is a shot with the explosives around them where you see Neo reaching out, fighting them (using his "force" powers) It's just a split second, but it took me out of the "no Neo-power" mood. Not that critical though. Audio editing was also mostly great. The stand out scene that sounded all out of sorts was when Neo meets the oracle and seraph the first time. When they are about to leave the audio did some very weird things. I gave the lowest score to narrative, but I would score the theatrical versions much much lower. I think it's still too long. The beginning 30 minutes are excessive. While an interesting intro, starting with the meeting would work too. There's just a bit much Niobe. I like the exclusion of Neo fainting and having power, but he is conspicuously absent after the Nebuchadnezzar blows up. It was handled nicely "sorry for taking so long" so we just assume he's been alone thinking. Still awkward but alright. I was also conflicted about something near the end. When Neo gets to the machines he knows that Smith is taking over the Matrix and offers his assistance. But he didn't know this prior to going. At first I thought that was a big problem, but it is actually a common theme in the movies. Like the Merovingian says, they simply follow orders. Again and again though it works out for them. In a weird way, Agent Bane worked out for Neo too, since he learns that Smith can get into the real world: if human then machine too. And that's his bargaining chip with the machines. So that's a success of the narrative I first thought was a flaw. Just wanted to add that. Some action sequences are a bit long, but overall you trimmed stuff up really nicely. I would have taken even more from Zion sequences though. I'm also not sure about the inclusion of some scenes. One is when Smith gets Seraph and the girl. I guess one needs to make sense of why Seraph isn't there when they reach the Oracle. But the presence of so many Smiths might be sufficient: we realize Seraph was copied. Besides, his end is pretty anticlimactic anyway. I really enjoyed watching this and will recommend it to others. Thanks for making it! Thanks for your lengthy and well thought out review. You definitely mentioned most if not all of the most difficult edits of this film. If you ever watch the movie again I would encourage you to try and forget your knowledge of the original film. Radical changes to scene structure and to narrative in fanedits are always more enjoyable if you can pretend that the sequences always happened that way. Finally got around to watching this edit. 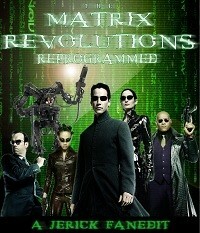 To call The Matrix Revolutions: Reprogrammed a drastic improvement would be doing this edit a disservice. I originally hated Reloaded, and, possibly due to lowered expectations, somewhat disliked Revolutions. I really enjoy this edit. I'll certainly watch it again. It really feels like the way Jerick presents it is the way it always should have been - one complete movie, with the as much crap removed as possible. Even still, it tends to drag a little in the middle. In another review, siebener suggested further trims to the burly brawl and car chase scenes. I must agree, that would have helped, especially to get the movie to clock in under three hours. Further reducing The Merovingian's tedious dialogue could have sped things along too, but that may not have been possible without glaringly obvious cuts. Those minor nitpicks aside, I would highly recommend any fan of the Matrix to watch this edit. It flows better, the story is easier to digest. If this had been shown in theaters, I believe the Matrix would be a much stronger franchise. I loved the first MATRIX movie when I saw it in theatres back then. I don't know if anybody here is into German 70's movies, but I actually thought it was inspired by Rainer Werner Fassbinder's WELT AM DRAHT. (If you've never seen it, please, try and find it. It was based on the novel Simulacron-3, that was later adapted as The Thirtheenth Floor, just without ANY SFX, since it was a German TV movie. In the f*cking 70's!) The Matrix was also probably the last time I was truly blown away by SFX in movies. Later I was really disappointed with RELOADED, so much in fact, that I didn't even see REVOLUTIONS in theatres. When I finally saw it, I was baffled. I thought it was stupid. Maybe I was stupid. I just didn't get it. I seriously had no idea what was going on and I thought the CGI looked horrible. "Horrible" meaning: way too ambitious for what was possible at the time. Over the years I kept reading articles about the MATRIX or listened to podcast about it, but I never felt the need to revisit it. Jerick's fanedit was the first time, I actually did rewatch it. I thought it was great. Finally I knew what was going on, what the character's/the machines wanted and what the idea/the philosophy behind it all was. I also loved the pacing. It didn't feel like anything was missing. I could have done with a shorter Burly Brawl (what does that even mean?!) and car chase sequence, but I didn't mind them in this version. I guess, I enjoy these kinds of fanedits the most. Fanedits, that peel away all the unnecessary crap and reduce a movie to its basic story. Having said that, and I'm sorry for bringing it up, I still think The Wachowskis are full of sh*t.
For some reason I can't shake the feeling, that they paid some intern to google "cool sounding names from whatever mythology", while they spent their time storyboarding how high up in the air Neo can punch Agent Smith. I don't know. I love the first movie, because it leaves all the right things up to your imagination, but I honestly think the sequels are only deep on a surface kind of level. If that makes any sense.